I have always liked myths. Even more so when Jung helped me see their inner life and I learned that, far from being just stories spun by human fantasy, they are windows into the psyche, reflecting all the perambulations of experience that define us such as love and hate, courage and fear, loyalty and betrayal, exploration and boundary. We have this notion of myth, however, as synonymous with what’s untrue; entertaining, but nothing more. But this is to misunderstand, for the story is but the shell. At the heart lies the kernel of truth. 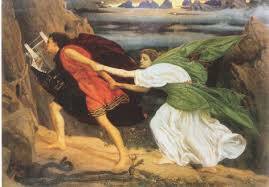 One of my favorite myths is that of Orpheus and Eurydice. You may remember that it tells of the death of Eurydice and of Orpheus’ fervent love for her that brings him into the Underworld, or dwelling place of the dead, seeking her return. To secure her return, he must observe Hades’ one condition: in leading Eurydice out of death’s realm, he mustn’t look back or he’ll lose her forever. But of course this is just what Orpheus does, nullifying any possibility for her to resume life. Not looking back, or what you and I might call second guessing, is inherent in myth. We see it even in the Old Testament when Yahweh enjoins Lot and his wife not to look back at Sodom as they exit its destruction. Lot’s wife disobeys and becomes a pillar of salt. For me, the myth of Orpheus and Eurydice teaches us that living in the past, or looking back, is self-defeating, for the dead can never return to us, given Nature’s unalterable laws. Orpheus’s backward glance is simply a story artifice to undergird that sober truth. At another level, Orpheus’s motivating loneliness demonstrates the frailty of the human condition when it comes to losing those we dearly love–a lingering emptiness, the sense of shock that sets in, perhaps anger at what appears unjust, the seeming shallowness of well meaning comforters. It is a literal fact that I still think of Sara every day of my life and almost every hour of the day. Whenever I see anything she would have liked, I find myself saying I’ll buy it and take it to her, and I am always thinking of things to tell her. Time’s gift, however, is that it can soften death’s contours, enabling us to move with life’s currents into new venues, with abiding memory becoming a gift of solace. Perhaps the heaviest grief falls upon those who have never found someone to love. To have found love, on the other hand, is the greatest privilege of all, and knowing this gives promise of our healing. This entry was posted in Psychology, Reflections and tagged H. L. Mencken, Julian Barnes, Jung, Levels of Life, myth, Orpheus and Eurydice. Bookmark the permalink.